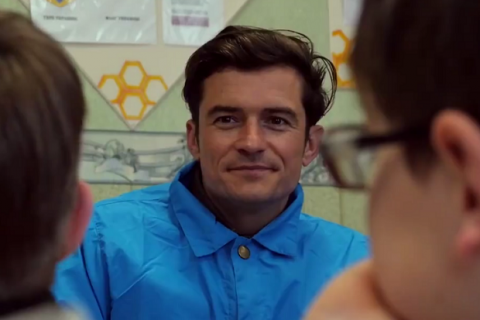 UNICEF Goodwill Ambassador Orlando Bloom travelled to conflict-hit eastern Ukraine to raise awareness of the global education crisis facing children in humanitarian emergencies, the organisation reported on its Facebook page. Bloom visited classrooms hit by shells just three kilometres from the frontline of the conflict that broke out more than two years ago. “I met children like 11 year old Liana who hid in the basement of their school for almost two weeks, in freezing conditions, without lighting or heat, while shelling devastated the classrooms above,” said Orlando Bloom, who first travelled to see UNICEF’s work in 2007. UNICEF reminds that approximately 580,000 Donbas children are in urgent need of aid and more than 230,000 children have been forced from their homes. Around one in five schools and kindergartens in the region have been damaged or destroyed and around 300,000 children are in immediate need of assistance to continue their education.